Here's a video of an Alesis Bitrman that I modified for external control voltage input. 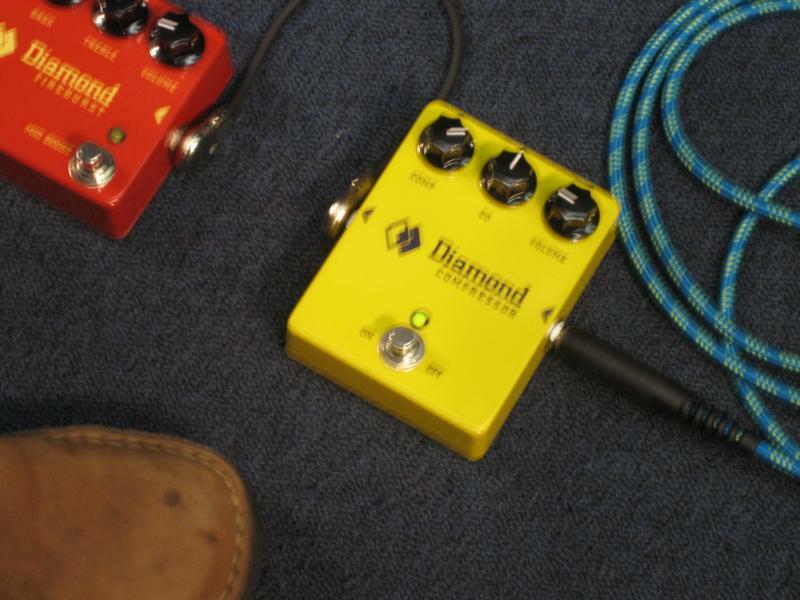 I think it takes an already good sounding effects box and allows it to really shine. While it's driven by a quantized voltage source in the video it's exceptionally good with a non-quantized source such as a Serge TKB. Then you can tune the the frequency shift amount, or ringmod sidebands, to be in tune with the pitch of that particular step. Loads of fun. After wasting a couple days on the aforementioned Opcode Sonicport project I was finally able to import audio from my DAT player to replace the woeful audio the camera's built-in mic captured. I recorded 15 minutes of various Oberheim Two Voice noodling to show off what the combination of two SEMs and a sequencer can do. I broke the video up into segments. This is the first of several. I picked up an Opcode Sonicport SPDIF to USB audio interface many years ago. The Windows 98 driver and config application were always a bit sketchy and didn't get a chance to improve as Gibson purchased then disbanded Opcode. As far as I know there was never a release of the config app that ran under Windows 2000 or XP. Since I didn't like the idea of keeping a Win98 host around for eternity I poked at the internals to see if it's possible to change from analog to digital I/O without writing a config app. The device uses a Philips/NXP UDA1335H USB to analog and I2S bridge. SPDIF to I2S conversion is handled by a Crystal CS8425. The UDA1335H uses an 8051 derivative for housekeeping booting its code from an external EPROM and storing parameters to a 24C16 serial EEPROM. I've thought of several elegant ways to address the config issue but for now I'm just manually swapping 24C16 EEPROMs after having stored the different configs I used. The original Opcode Sonicport/Datport driver utility disk for Windows 98 is available here. Images both an analog config and a digital 44.1k 16 bit config available here. Several folks asked (demanded?) that I post some soundclips of my Serge in action. Below is a link to a 10 minute mp3 of the Serge with a free running patch and no sequencers or external controllers. Warning: I recorded this at 2am last night and didn't have my speakers on so there is _way_ too much low end in places. 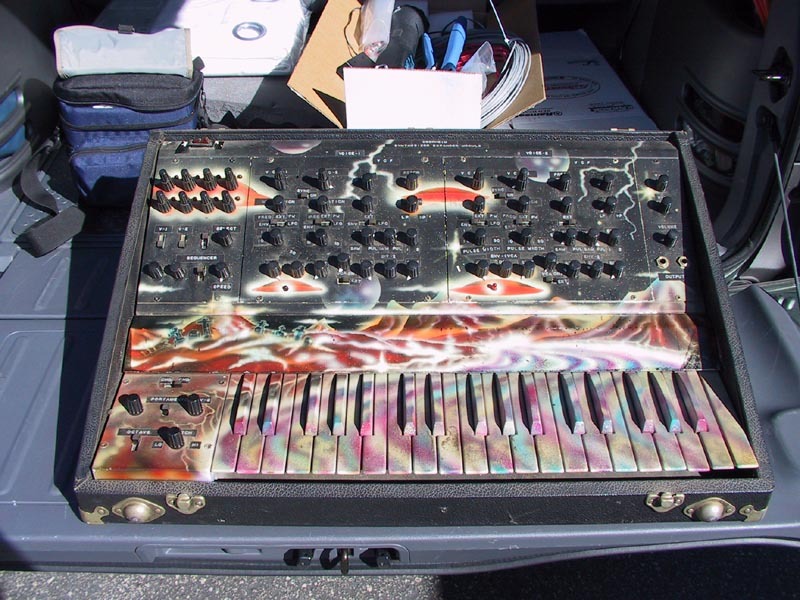 Someone on Analogue Heaven asked "hey whats some of the craziest stuff you guys have seeen in terms of paint jobs and modifying the looks of a synth..."
That's an Oberheim Two Voice buried somewhere under that hideous paint job. Jason Proctor asked me a while back to burn some PPG wavetables into some ROMs for the Blacet Miniwave. I was a little concerned about how he was going to sweep through the 64 waves per bank. This isn't real easy as the Miniwave only has 16 waves per bank whereas the PPG had 64 waves per bank. I opened my big mouth and said it wouldn't be that difficult to build a PCB with surface mount FLASH that crams all of the PPG wavetables into a nice small plug and play package. With a little bit of swizzling of the address lines of the bank and wave A/D converters it'd be trivial to drive with no external CV processing. I've built five beta units (in addition to a single wire wrap prototype) and they work just fine although my intended method for programming them didn't pan out. I'll have to come up with another scheme for bypassing the onboard logic while programming the FLASH and spin another board. 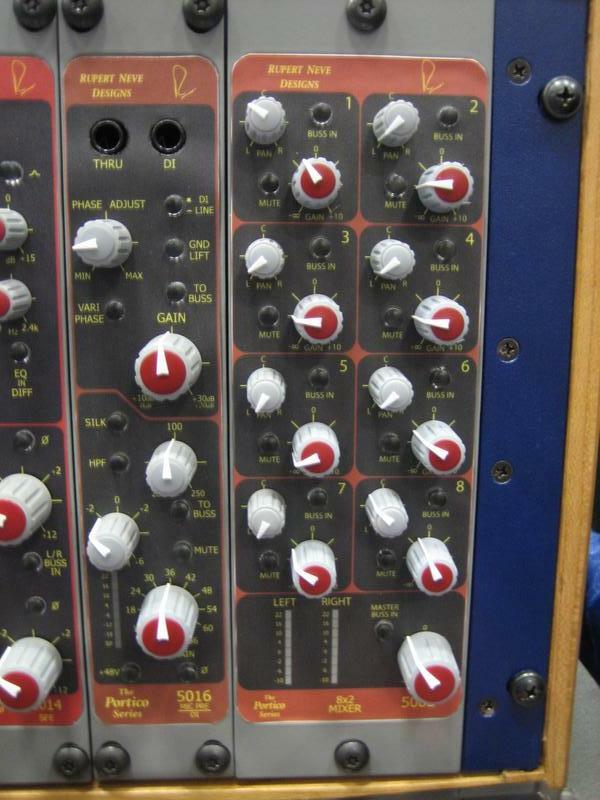 There don't seem to be any photos of the Don Martin era Moog modules so I posted some pictures at my site below. NO, THEY'RE NOT FOR SALE! The construction is surprisingly good. 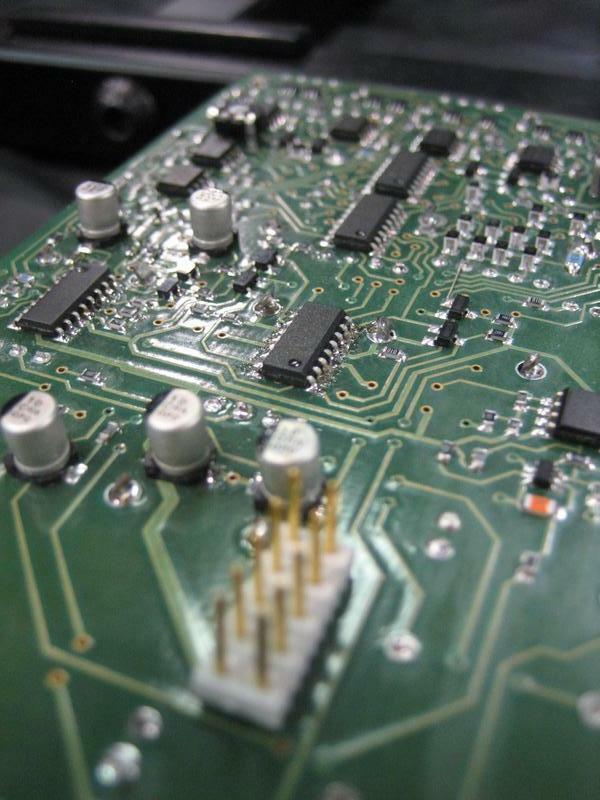 Circuit board artwork and component layout is similar to RA Moog modules. Where Don really screwed up was the truly abysmal power supply with so much ripple that the oscillators would sync even when tuned to fifths or better. 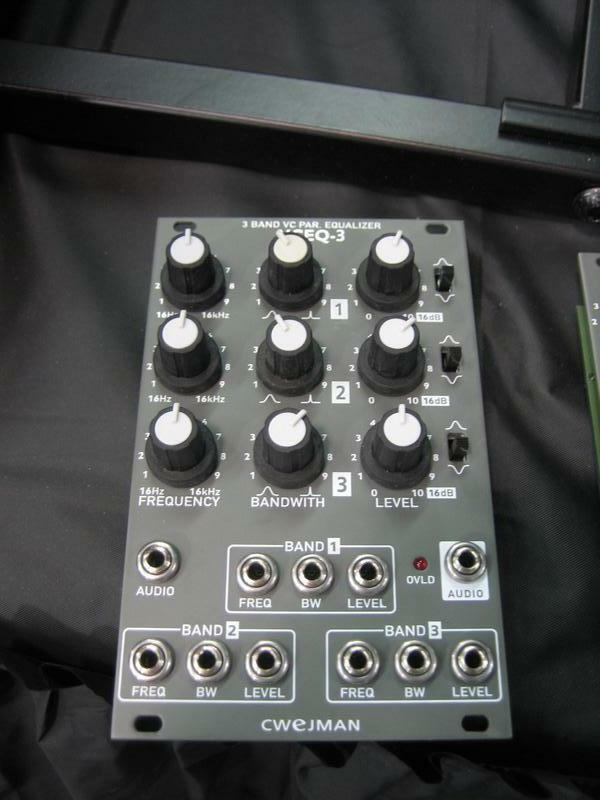 Unfortunately I didn't have these back in 2002 when Peake and Konkuro and I A/Bed original RA Moog with synth.com stuff. 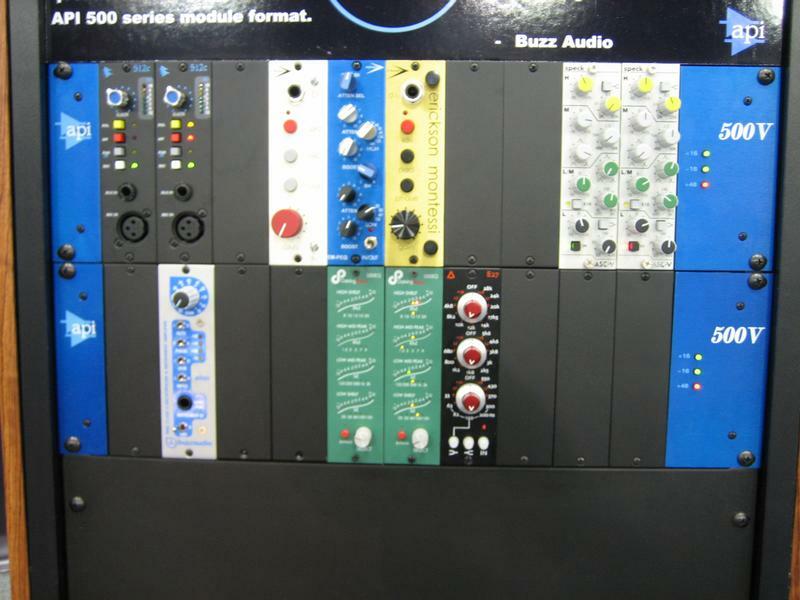 Below is a list of modules Don Martin / Moog Music claimed to be manufacturing. I have not personally seen all of these modules so cannot speculate if all were manufactured. I have (1) 9501, (1) 9501A, (2) 9501B, (2) 9502, (1) 9503A, (1) 9504A, (1) 9505, (1) 9510, (2) 9511, (2) 9800R, and (1) blank panel. I think the original modules released were limited to those available for copying from Ohio University's system, which I should mention was never returned. I have some audio from the event on DAT but I'll probably never get around to dumping it into a computer and editing. A ramp wave is created by a Serge PCO and is DC mixed with the output of a quadrature oscillator. The resulting wave is amplitude modulated by the 90 degree output of the above quadrature oscillator and feeds the input of a Blacet Miniwave. 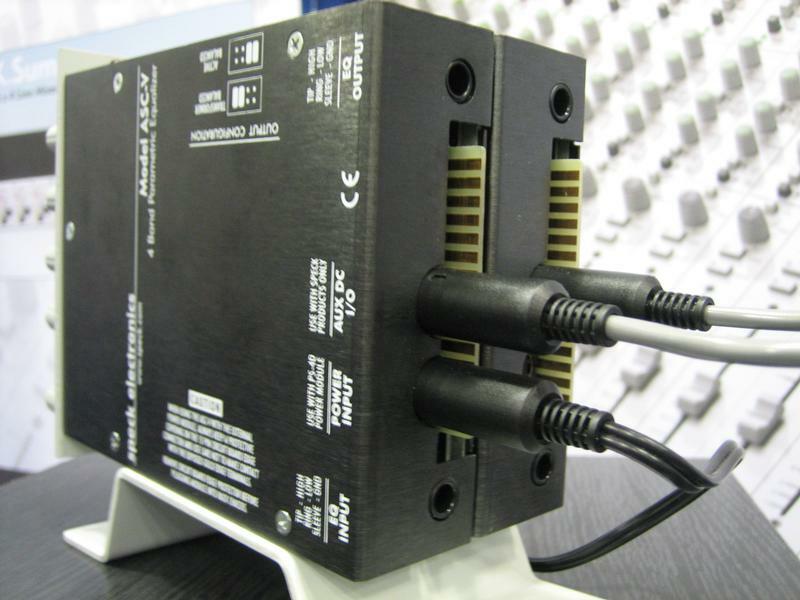 The Miniwave's wave input is modulated by a dual universal slope generator. The audio output of the Miniwave goes into an audio mixer and then into the variable bandpass filter. The audio is taken from the lowpass output while the bandpass output feeds back into the audio mixer in front of the VCF2. The bandpass output is mirrored into a detector and comparator and triggers an extended ADSR which modulates the bandwidth of the filter. Another DUSG modulates the cutoff frequency of the filter. I use 1/8" stereo to dual 1/4" mono cables when interfacing with other gear. You can normally get away with a stereo 1/8" to stereo 1/8" cable for gate but this doesn't work with all gear combinations. I attended AES in San Francisco yesterday. There was loads of great gear unfortunately a few too many "me too" products with nothing to differentiate themselves from the originals. I'm not into plug-ins so am only reporting on physical hardware. 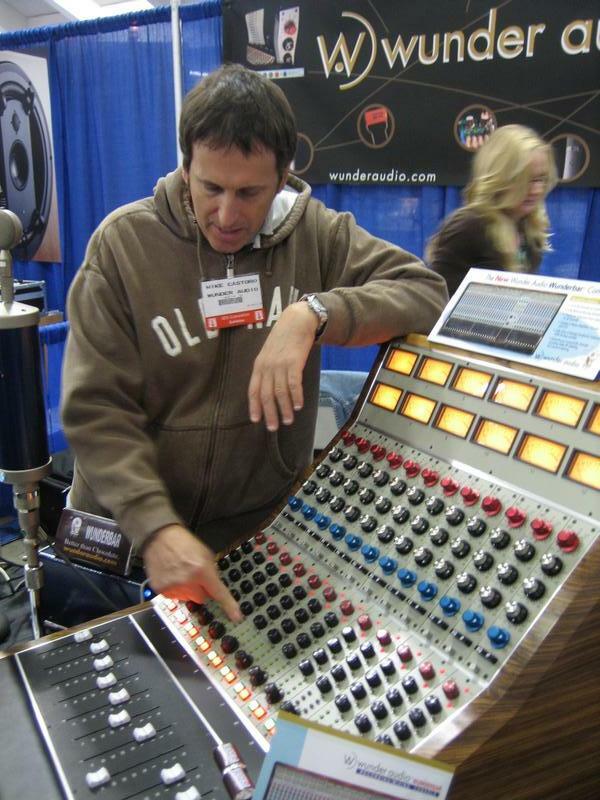 I'm sure there were lots of great advancements in computer based recording at the show however you can read about them elsewhere. 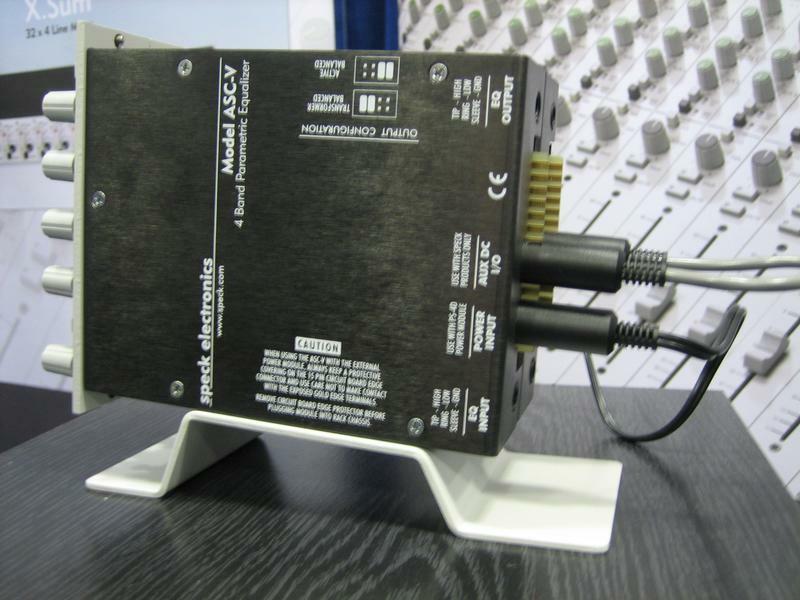 John Hardy didn't have his new API 500 series module ready in time for the show. The first module will be the Jensen twin servo with 10 segment VU meter, 20db pad, 20 ohm mic switch, phase reverse, and phantom power switch. No XLR on the front panel due to space issues. 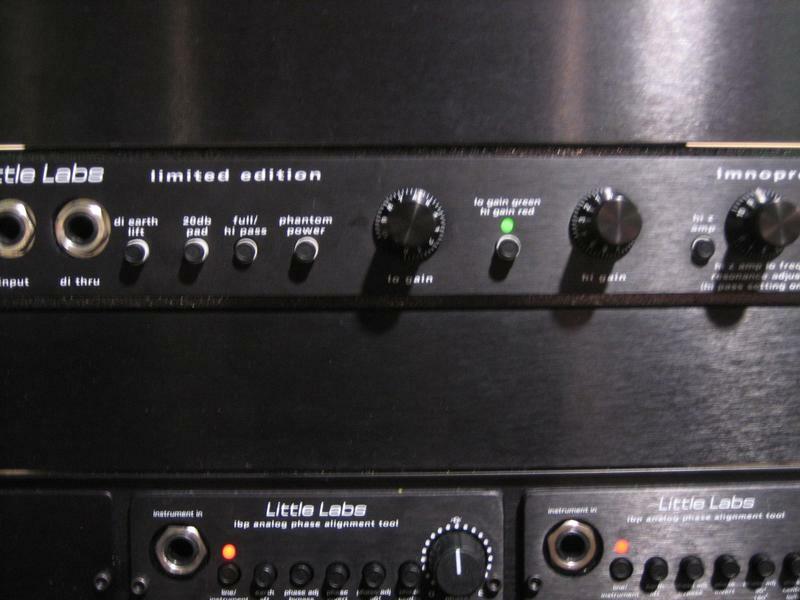 Jon at Little Labs had the final incarnation of his LMNOPRE on display. The units are finally within a few weeks of shipping. This unit is in its own territory sound and feature wise. In addition to both transformer and transformerless DI inputs it features an integrated IBT Phase Tool with external access and interesting switchable low pass filter or low freq resonator circuit. This is a great find for anyone who needs both a high quality high gain pre and DI and already has the traditional API or Neve sound covered. Core Sound was showing a prototype tetrahedral surround mic. In conjuction with the mic they will have a four channel mic pre with A/D that muxes four channels onto a 96khz SPDIF stream. Software will be available that seperates the streams back out to the original signals or decoded surround mix. Shiny Box was taking some heat from myself and Justin Morse for their new mic pre. 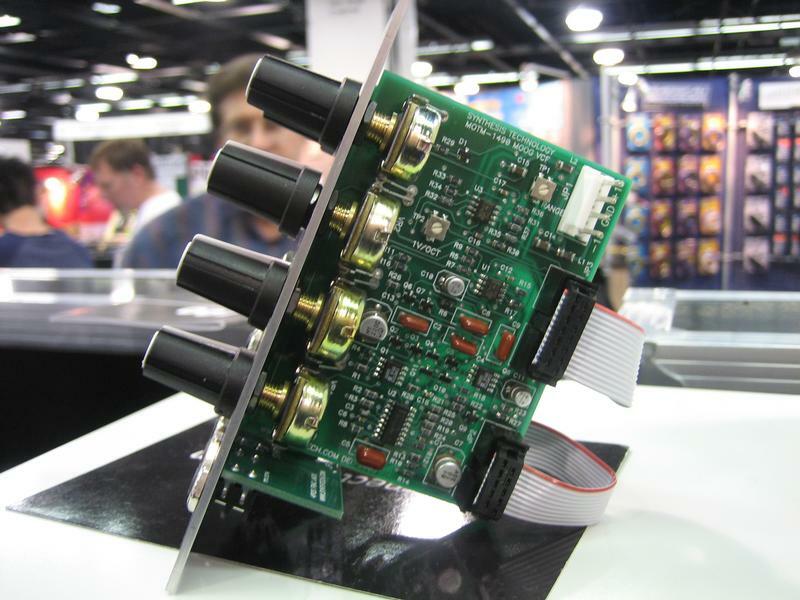 Jon Ulrig was being stingy with the details and other than "custom wound transformers" the only details we were able to extract were that it has a JFET buffered DI input and discrete non-modular amp design. But come on, there's got to be a more original face plate design other than the standard "312" faceplate everyone (Brent Averill, A Designs, Shiny Box, Eisen) has based their design on. And speaking of Justin Morse and Roll Music, they had their RMS755 stereo compressor out with a plexiglass lid. 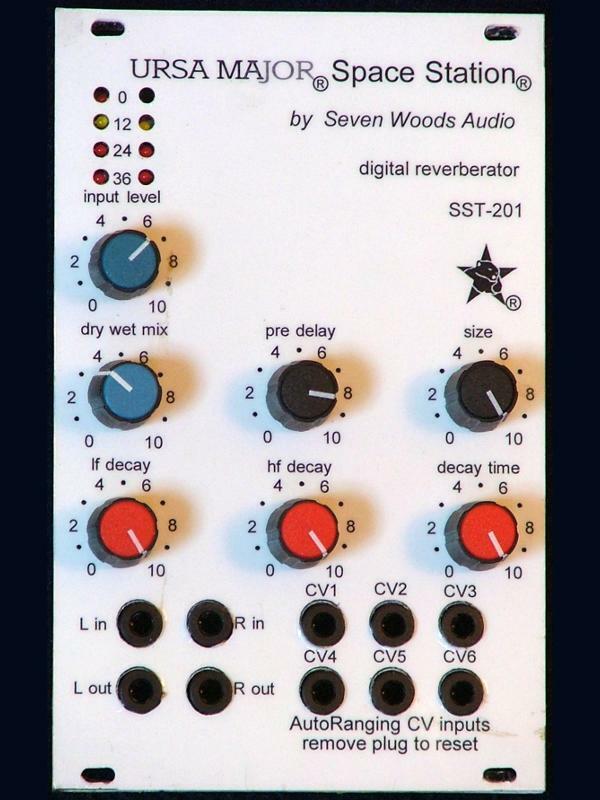 Contruction looks superb but I immediately noticed this is yet another THAT VCA based compressor with VCA sidechain. While I've heard this sounds nothing like a SSL compressor they didn't have any demo tracks on a CD player and headphones attached to give it a listen. Side note: Folks - if you want to sell gear have it set up for auditioning. None of the smaller boutique booths had good material to audition. The Avedis booth had a mic and pres available so I could audition their EQ but on a loud show floor, while better than nothing, this is far from adequate. A CD player, headphones, and headphone amp are a small cost when compared to booth costs and flying out for a show. This especially applies to folks without a good dealer network that allows a trial period. API announced the API VPR Alliance. Folks currently participating are A Designs, Avedis Audio, Buzz Audio, Daking Plus, and Speck Electronics. 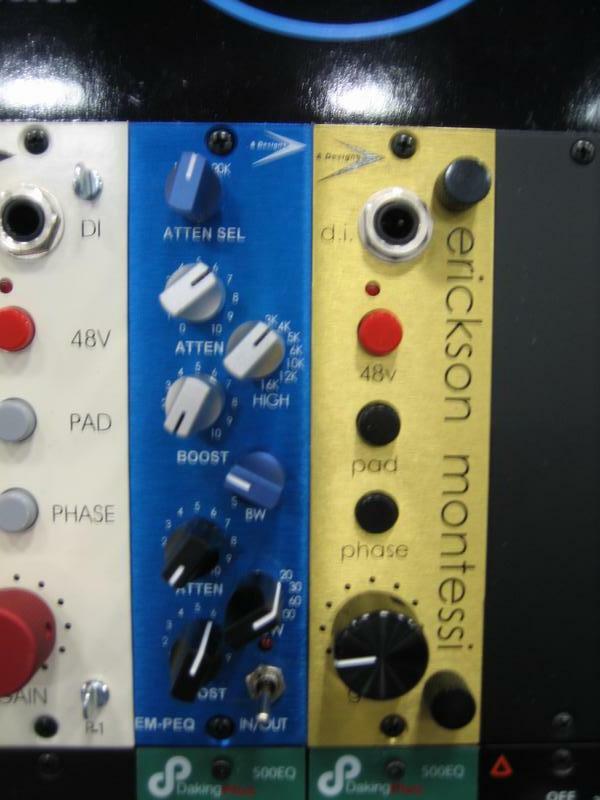 Whether this is merely marketing hype or good way to alert folks who might risk an expensive module in a less than adequate rack remains to be seen. 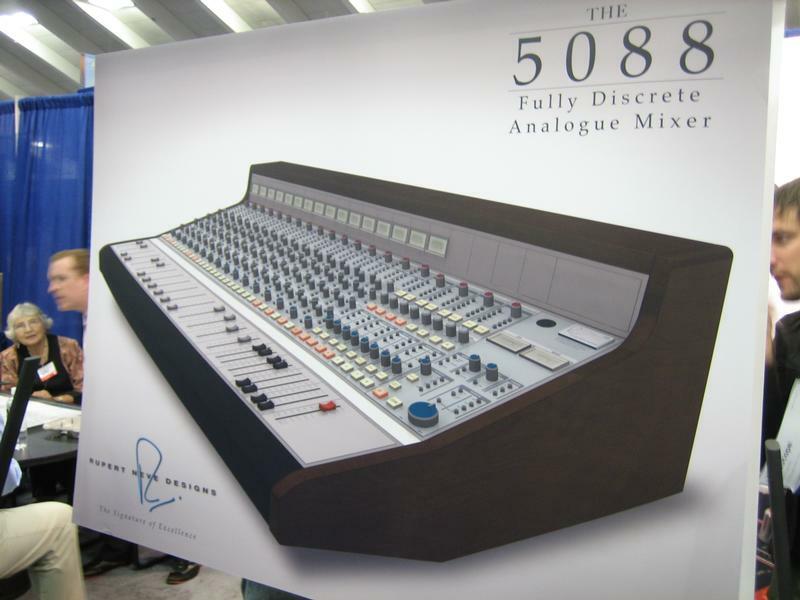 After supposedly swearing off consoles Rupert Neve announced the 5088 console. I don't have any details and no example modules were at the show. There was a computer generated image on a banner and CAD drawings of the module layout. New Portico modules include the 5082 8x2 mixer, 5014 stero field editor, and 5016 mic pre and DI. 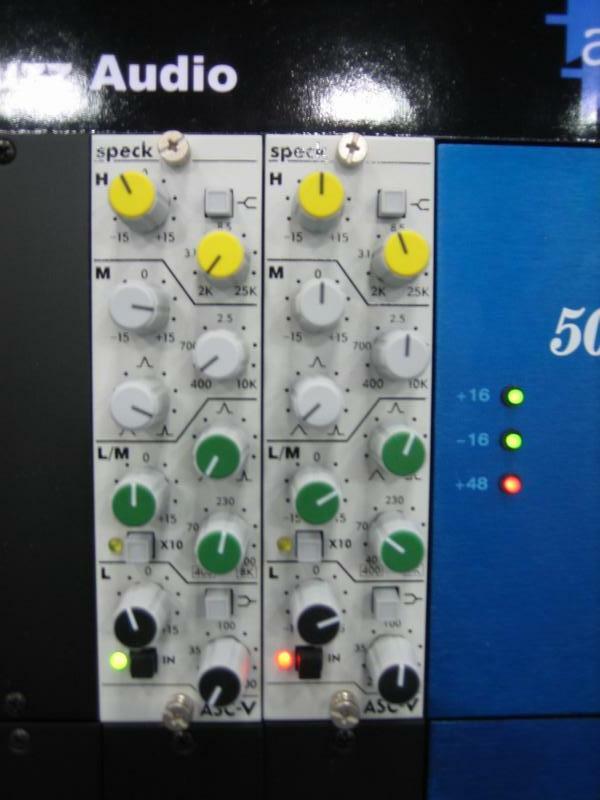 Speck introduced the ASC-V API 500 series compatible EQ. 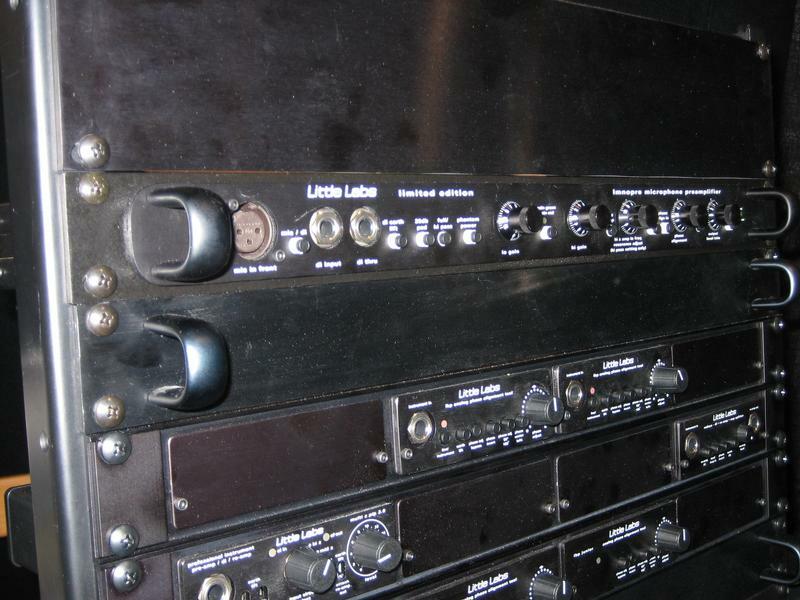 This unit includes all the features of the original ASC minus the gain control. The standout features is the internal power supply for rectifying and regulating power from an external AC adapter for use without a lunchbox or rack. The power supply has enough capacity to power a second unit. Input is electronically balanced and output balancing transformer can be bypassed. Due to the resurgence of interest in small modular consoles GML is re-releasing the HRT 9100 series modular mixing system. 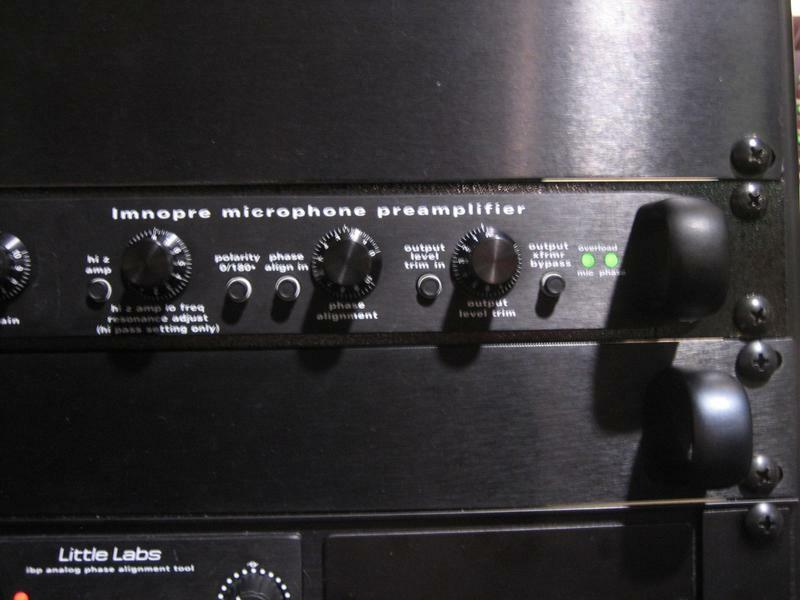 Supplementing the original HRT9115 input module is a new mic pre and HRT9125 three band EQ. 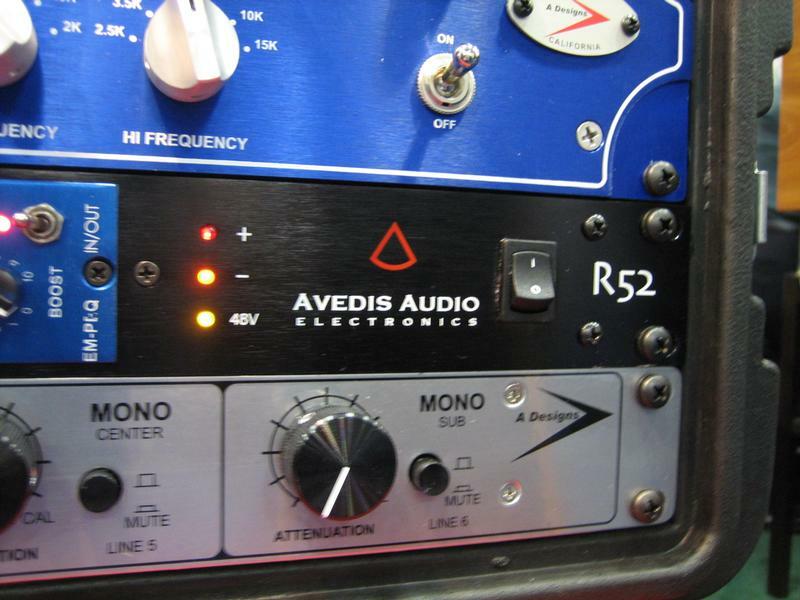 Avedis Audio was showing their E27 three band equalizer and R52 1U dual rackmount shelf. After giving the E27 a listem I'm really dissappointed that it's packaged to look similar to the original API 550. 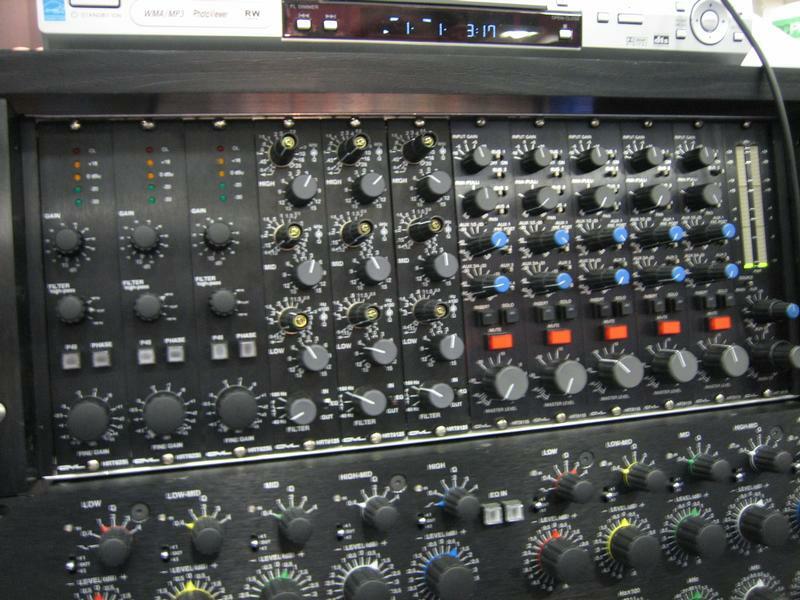 This EQ has so much more to offer including nine frequencies and bypass per band. 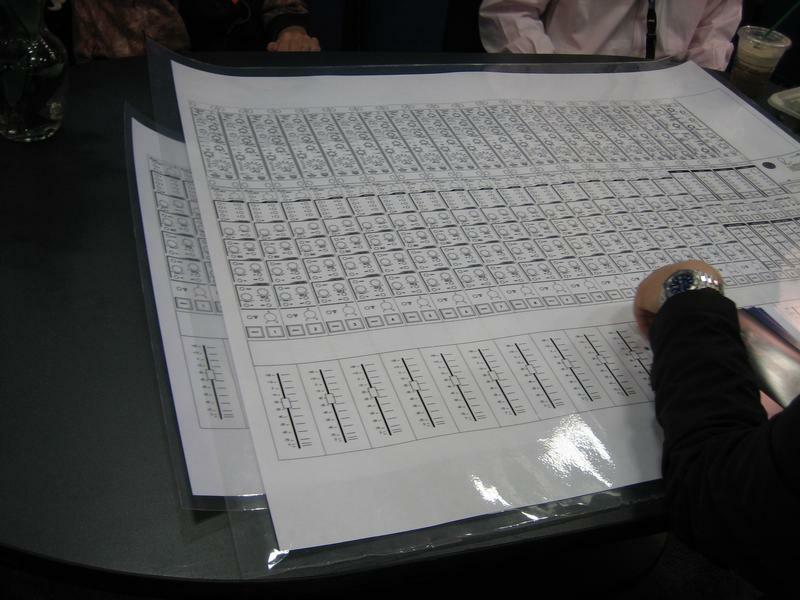 They had a unit at the booth open for inspection and the design of the circuit is a not a copy of the API units. The gain of each band is continuously variable and I was amazed has how much I could sculpt out with this EQ. Anyone who already has a couple API 550s and seeks variety should give this a listen. 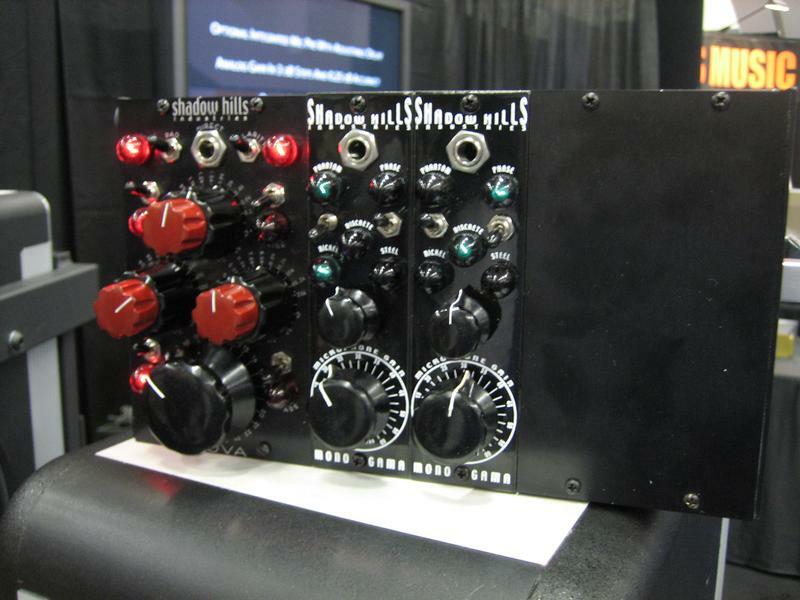 Shadow Hill Industries had their GAMA mic pre and new API 500 series equalizer on display. Neither were hooked up so I didn't get to audition them. 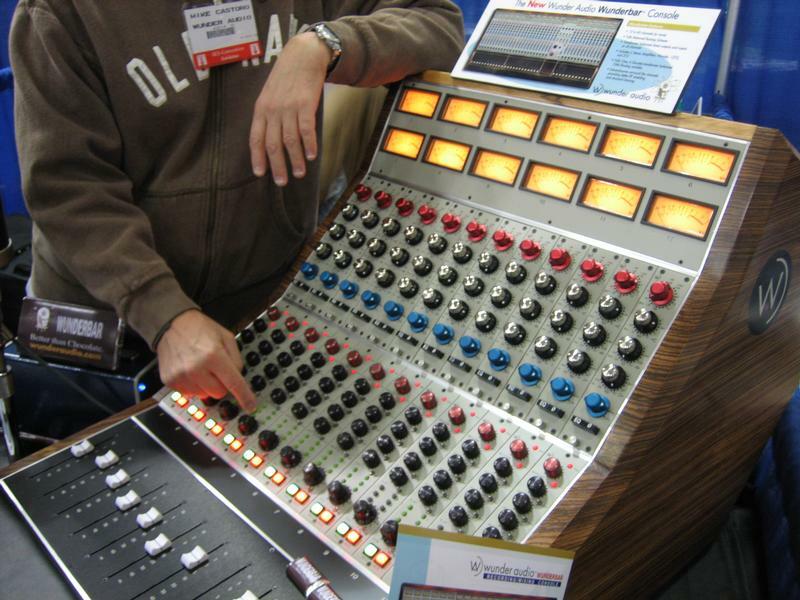 Wunder Audio had a 12 channel bucket from their new Wunderbar console. 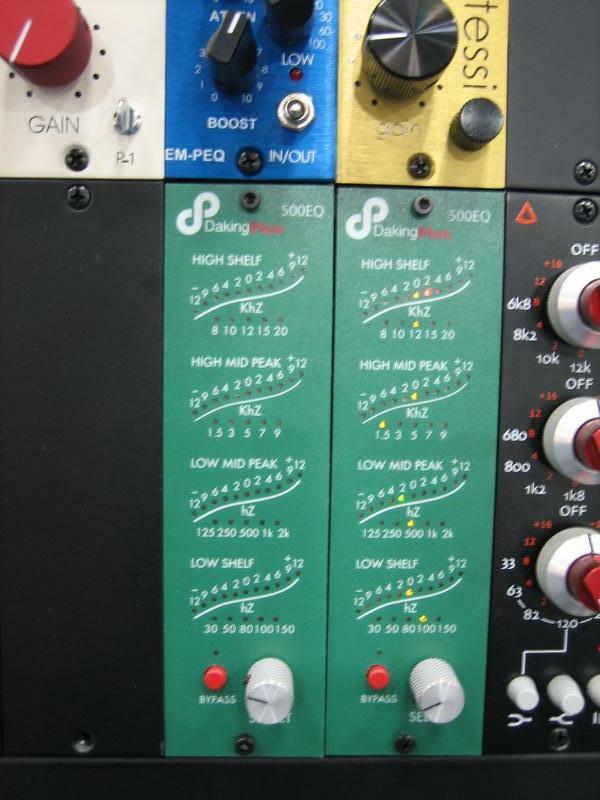 Each channel strip features four aux sends pre/post switchable, pan with bypass, secondary input with fader flip, and six busses - each pair with a different mix buss topology (Wunder, API, or Neve). The center section has eight returns with pan routable to any of the six busses and level controls for the four aux sends. The build quality looks superb but the lack of flexibility might be an issue for some folks. 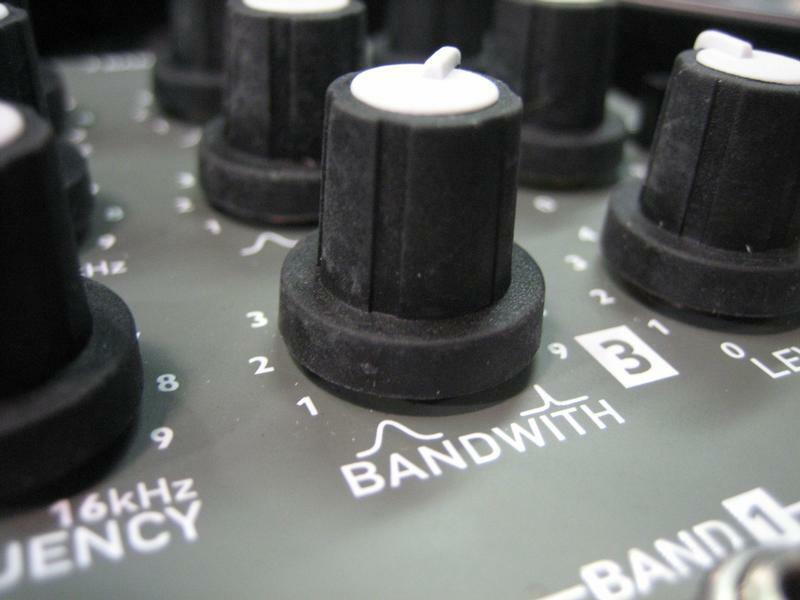 An inboard patchbay would be a good idea if not a necessity. 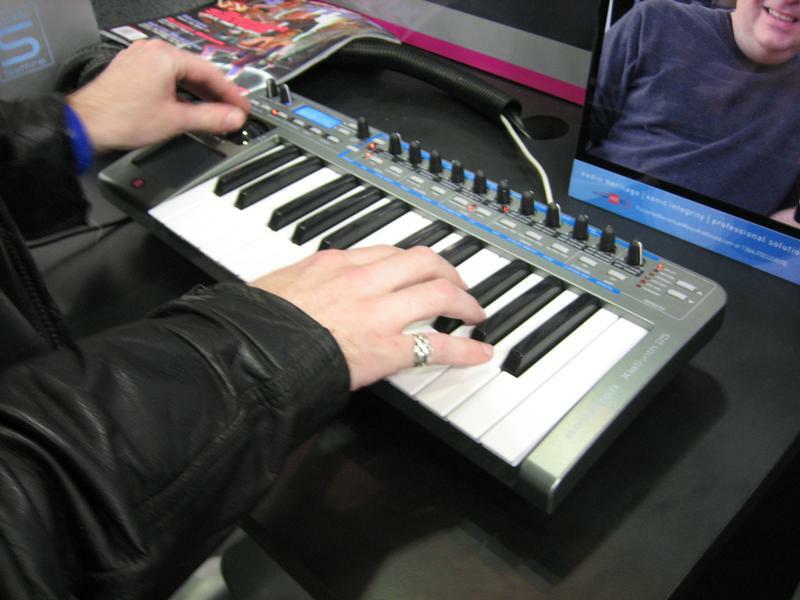 Novation was showing their Xiosynth, a 25 key low cost synthesizer with integrated USB MIDI and two channel audio interface. The unit features eight analog modeled voices and can operate standalone on either AA batteries or external power adapter. The internal patches were pretty decent and the XY touch pad was a blast. 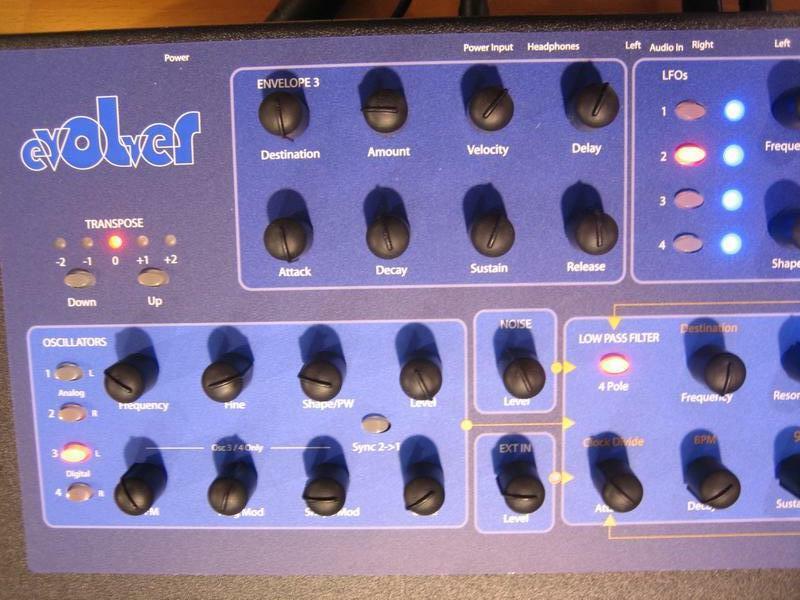 I was less impressed with the x-gator feature but the arpegiattor was usable and the key action wasn't too bad for a synth in the $300 street price range. Any analogue fiend looking for a USB keyboard controller should definitely give this unit a once over. - I got a chance to check out the JazzMutant Lemur in person. The bantering about on the web doesn't do it justice. 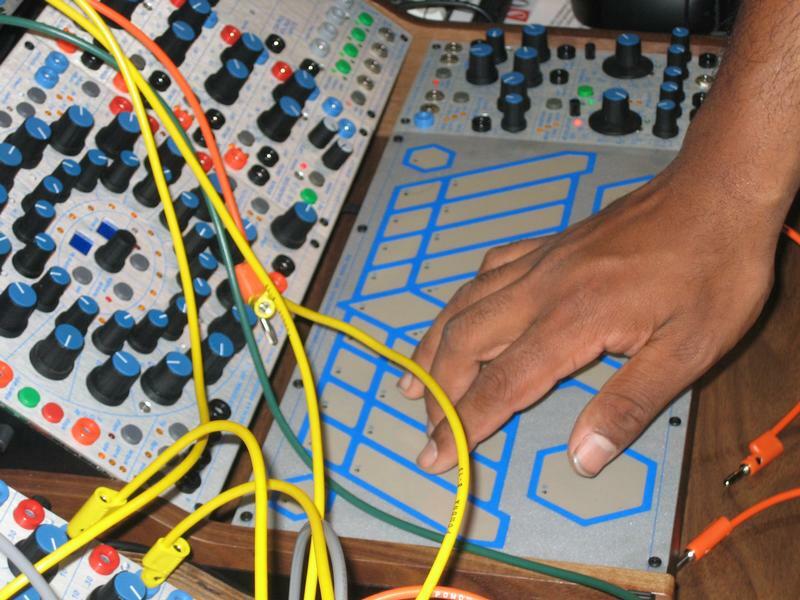 It's not just a touch sensitive LCD control surface for DAWs or synths. The unit is programmed with a drag and drop GUI interface on a host computer and offers some really interesting interactive manipulation tools. I was disappointed to learn that the unit does not speak MIDI but only ethernet, which means a host computer is required for live performance. Maybe they'll eventually rectify this, or someone will release an OSC to MIDI converter. 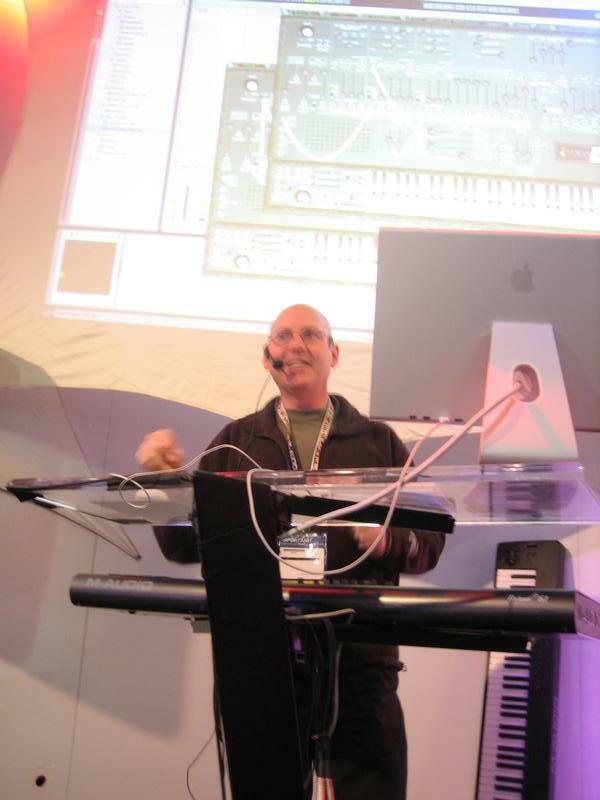 - Robert Rich was demoing the TimewARP 2600 software at the M-Audio booth. 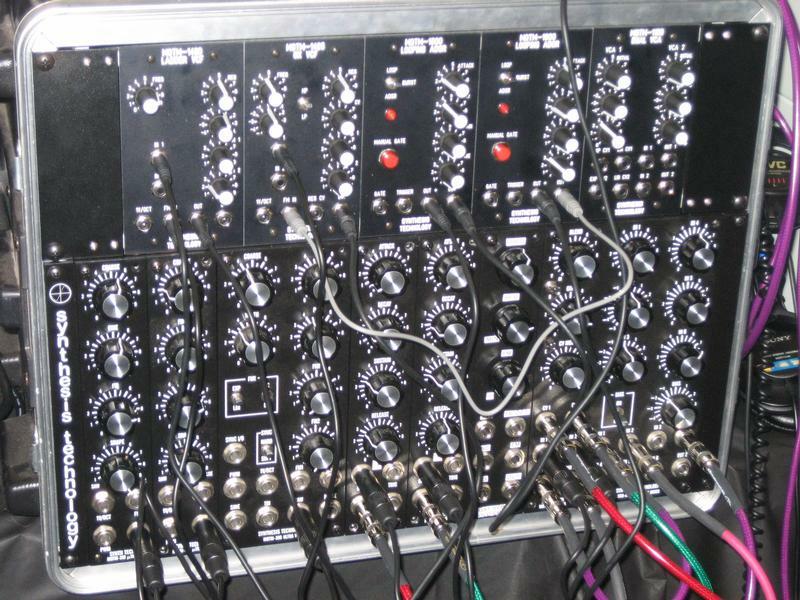 It's the first ARP 2600 emulator I've heard that allows high frequency audio rate modulation of oscillators. I was disappointed that sidebands disappeared around 10-12khz, but the software's creator stated that he had used one of the 2600s with bandlimited filters when modeling the 2600. It would be interesting to see switchable 2600 filter types down the road. One really nifty feature of the software is the ability to route velocity, aftertouch, and continuous controllers to any parameter with variable range and amount per parameter. With this amount of flexibility the CS80 finally has some competition for expressive sounds. 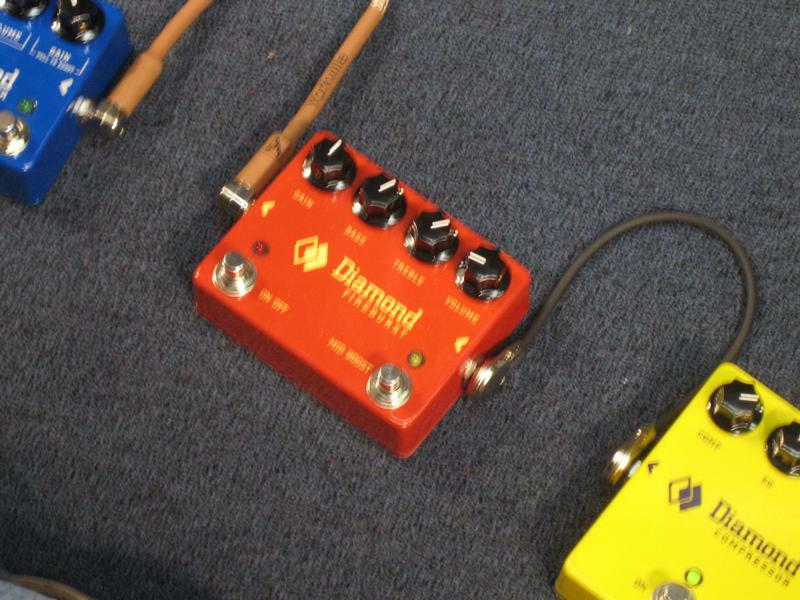 - While walking the show floor I stumbled upon the Diamond Guitar Pedals booth. I had recalled seeing these in a boutique guitar shop a while back but hadn't thought much of them. 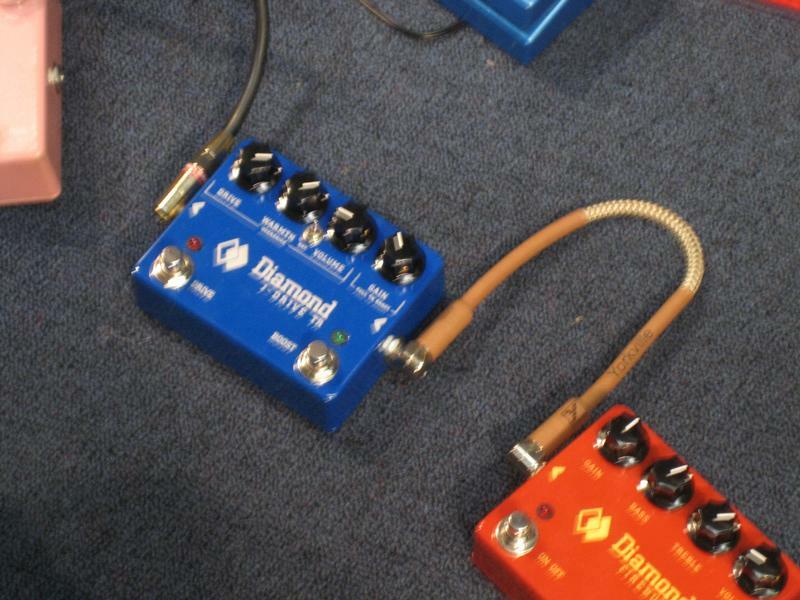 However, Diamond had all their pedals open and available for a peek inside at the booth. They are not afraid to show off the top notch design and construction. 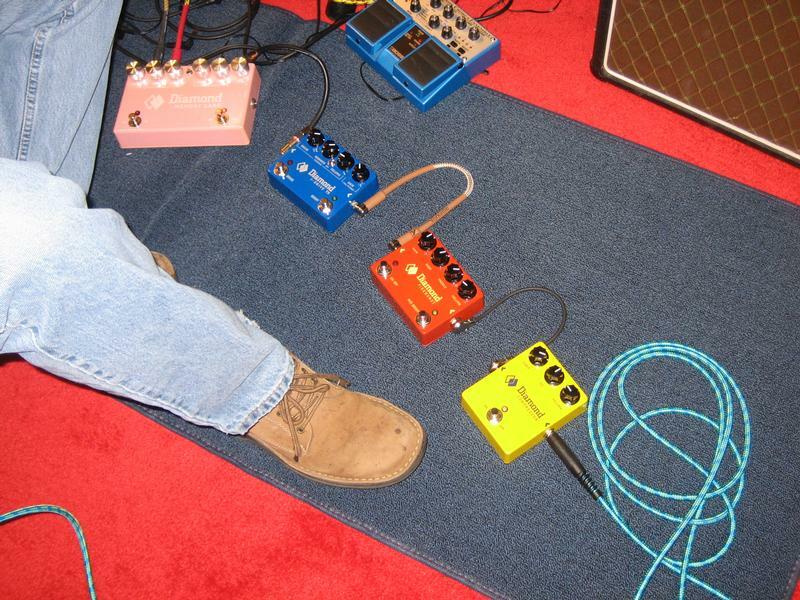 I was especially impressed with Memory Lane delay pedal especially in operation. The thing sounds absolutely wonderful and offers tap tempo which few if any analogue delays offer. 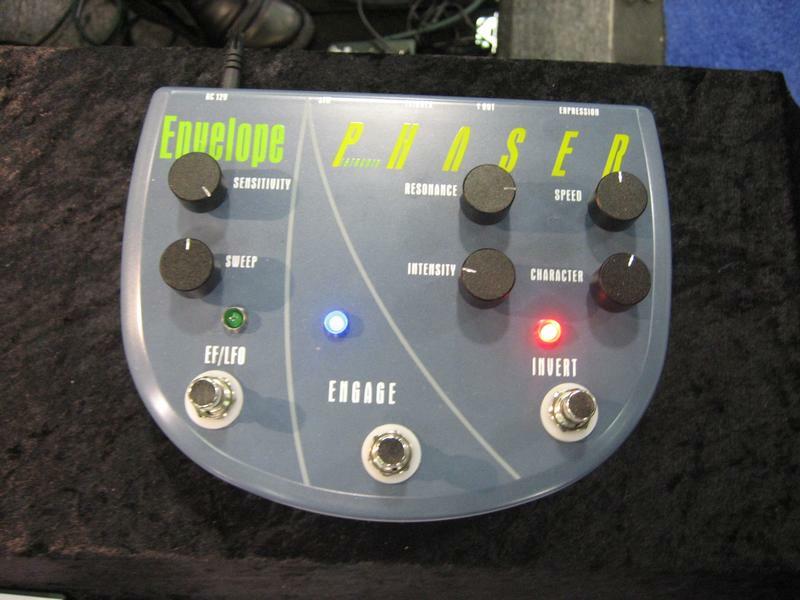 - The Pigtronix Envelope Phaser had an interesting sound and is a concept I don't think that's been explored before. Take an envelope follower and use it to shift the phase of the input signal. 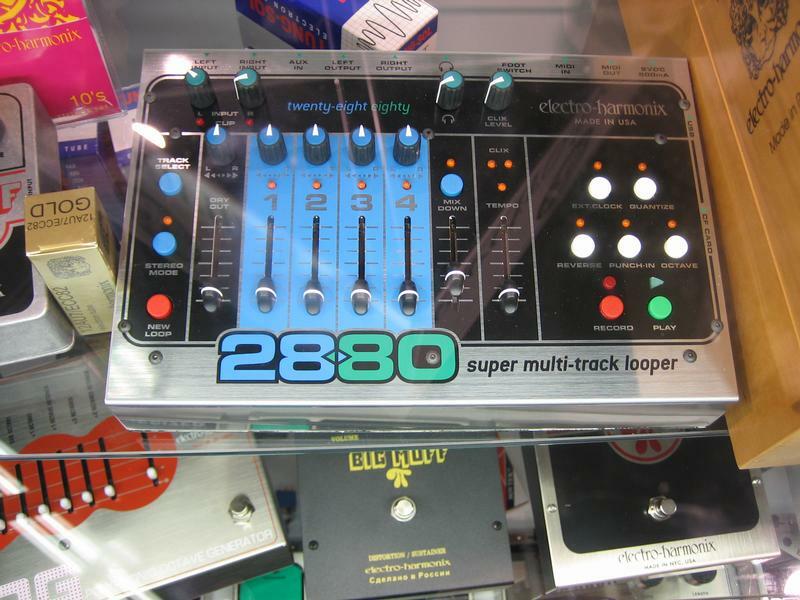 - Electro Harmonix announced the 2880 super multi-track looper pedal. 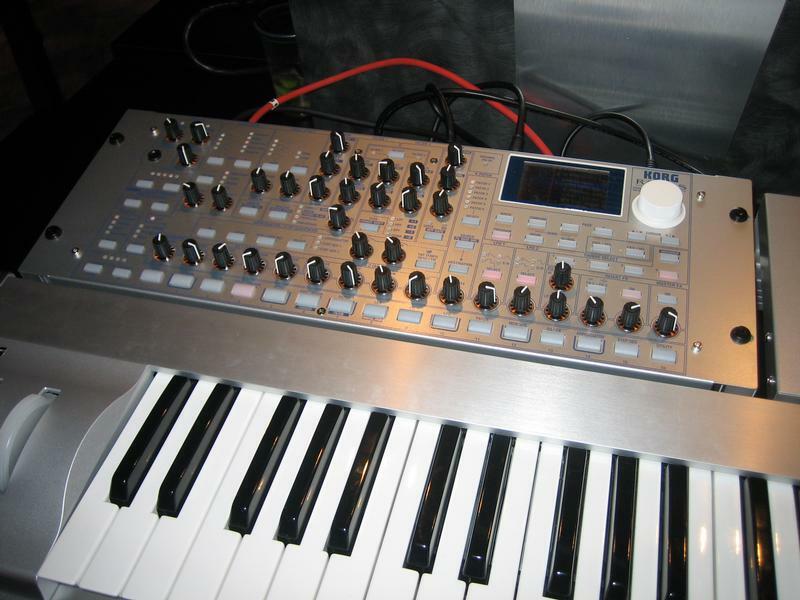 It offers four tracks, length quantize, reverse, writes to compact flash cards, and can connect to a computer via USB. Unfortunately, unlike the Digitech JamMan only one loop set can reside in memory at a time, whereas 99 loops can be stored in the JamMan. 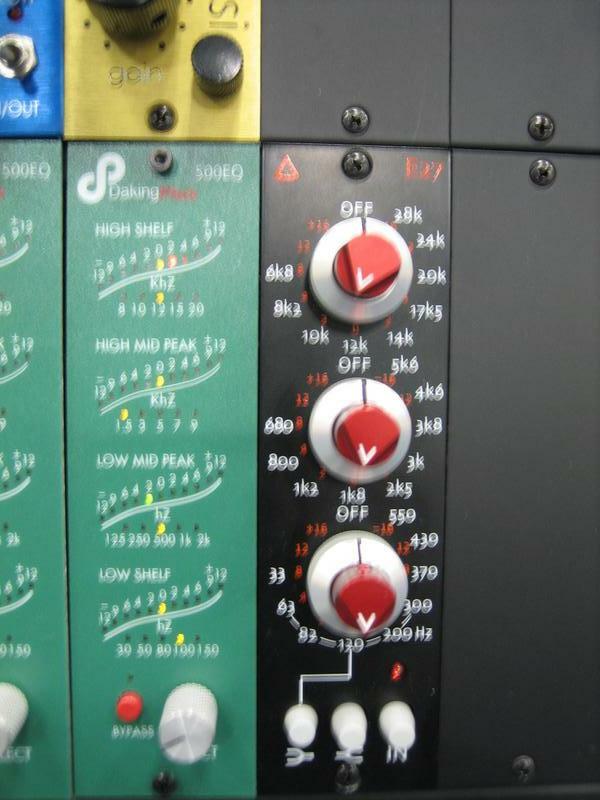 The JamMan however only supports overdubs whereas the 2880 supports four discrete tracks. 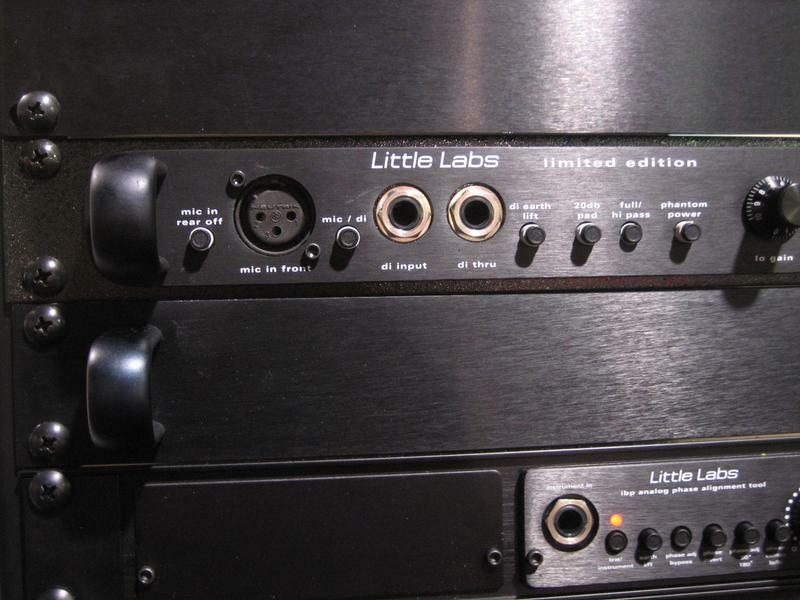 - The new Little Labs LMNOPRE mic preamp was on display at the show. The unit features fully discrete differential topology from input to output, built in IBP phase alignment box, DI input, and some sort of low frequency resonator/EQ circuit which I didn't quite get the full gist of. The unit looks to be a top notch product in the same vein of the John Hardy preamps but with the addition of the IBP this box really stands out. It should be shipping by summertime. 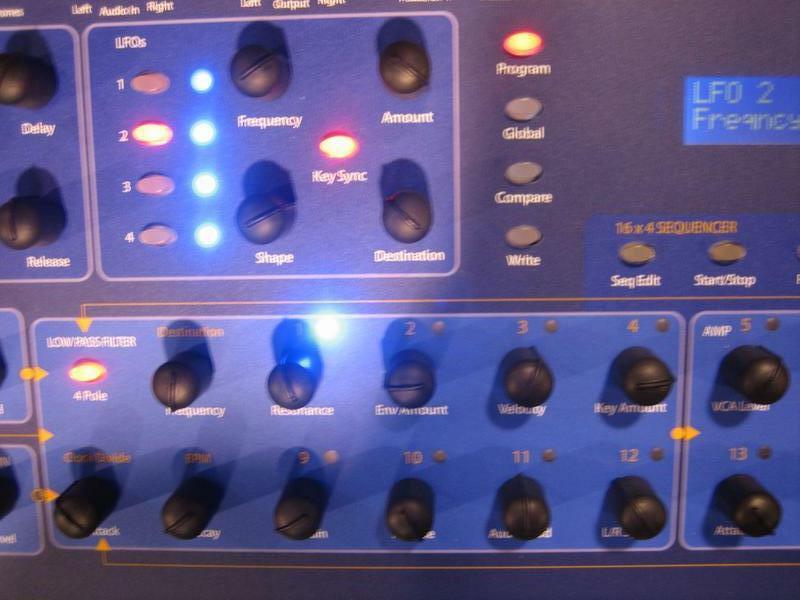 I spent some time playing with the stand alone IBP phase alignment box at the show and was amazed at what the box can do to the perception of high and low frequency content. Definitely something I'll be looking at picking up in the not so distant future. - And finally, the Looperlative LP1 rackmount multitrack looper looked interesting, however the person manning the booth was more interested in playing guitar than demoing how the box works. 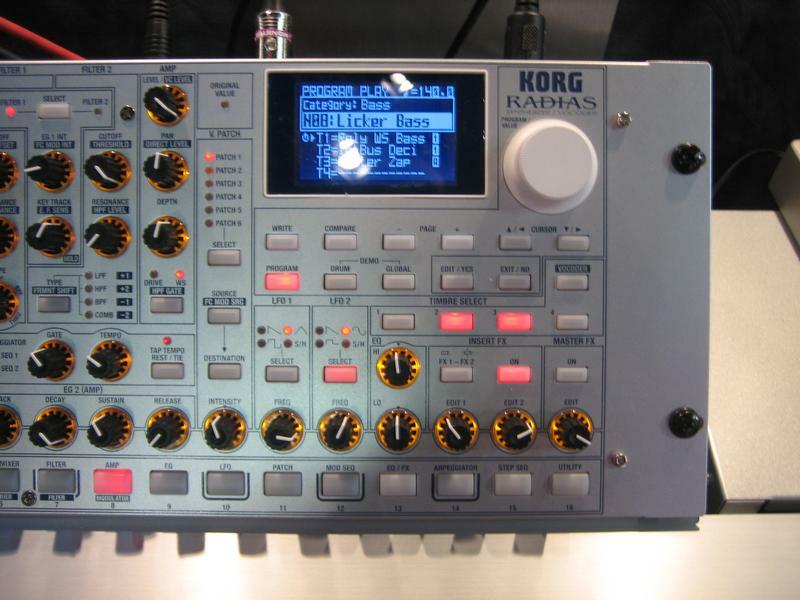 It offers eight simultaneous stereo loops, full midi control, and ethernet for off-line storage and updates. - Nothing new at the Moog booth, contrary to rumors before the show. I gave the new Voyager 3.x software a whirl. The new data entry knob function is a welcome addition and the octave transpose shortcut is nice as well. 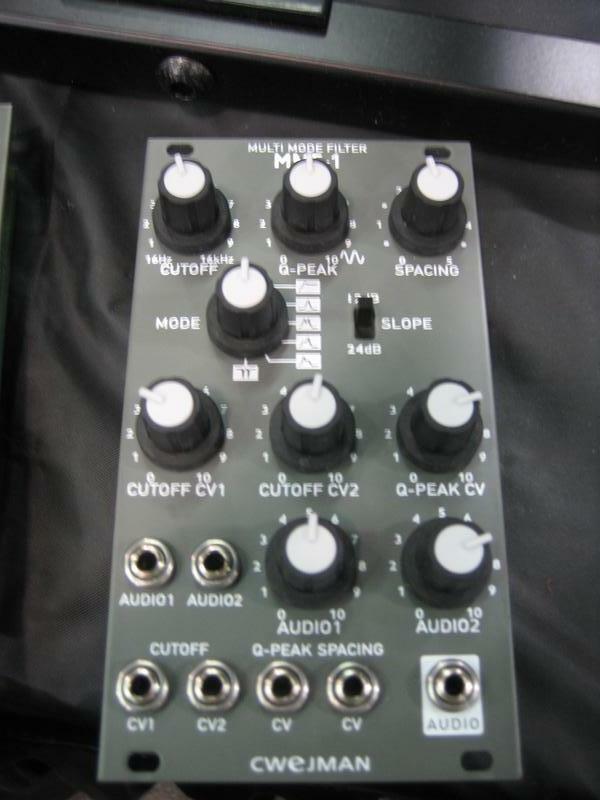 - The Crewjman eurorack format modular stuff looks killer. 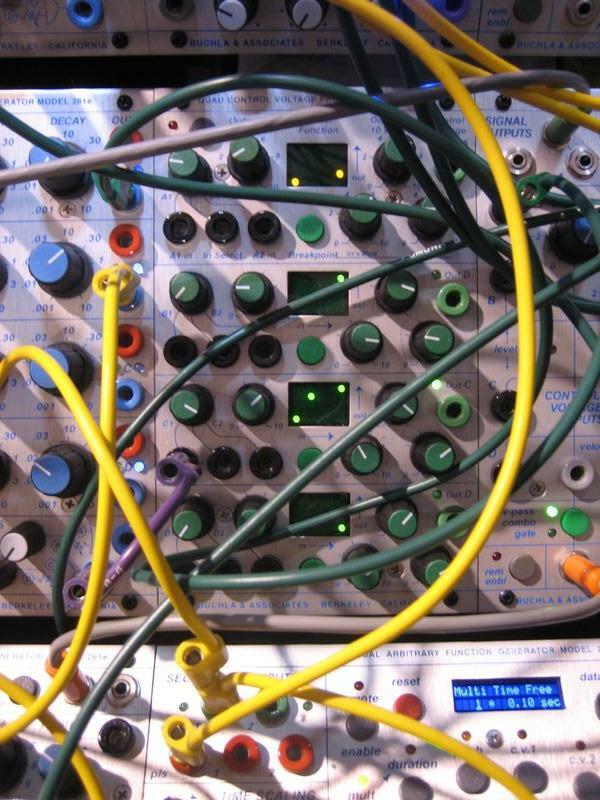 It's very shallow so you could do a EMS style modular in suitcase sort of thing. Hopefully the production units will have the spelling errors corrected. - Paul Schreiber's new MOTM frac-rack format modules look great, and existing MOTM owners will be jealous of the looping and manual trigger features on the MOTM-1800 ADSR module. 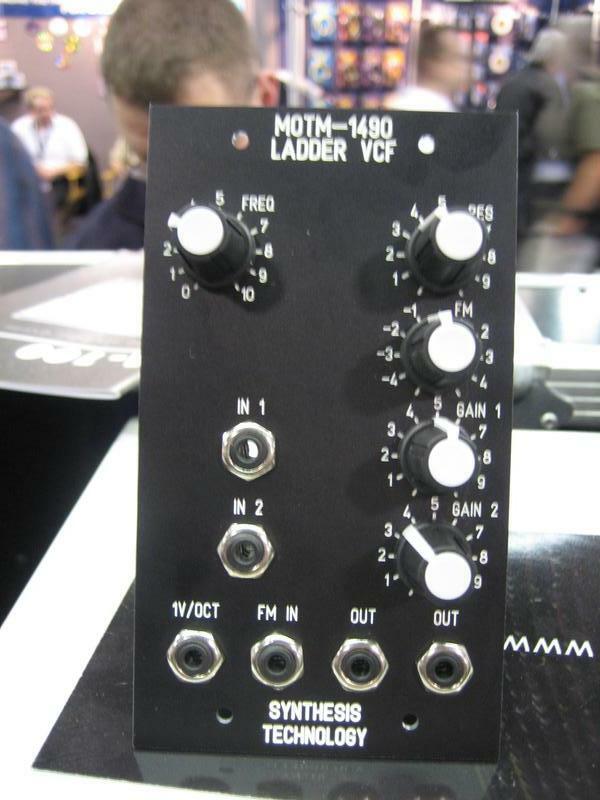 Modules at the show included the MOTM-1490 Moog style ladder filter ($199), MOTM-1485 Yamaha GX filter ($229), MOTM-1190 dual VCA ($249), and MOTM-1800 looping ADSR ($139). 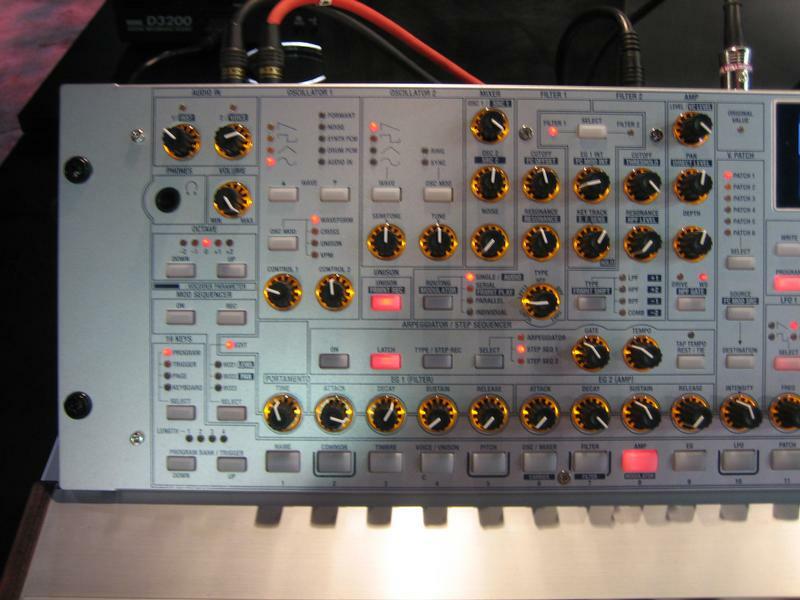 Other modules promised for 2006 are the MOTM-1650 MIDI to CV converter ($429), MOTM-1510 wavewarper ($299), MOTM-1475 diode bandpass filter ($249), and MOTM-1300 VCO ($299). 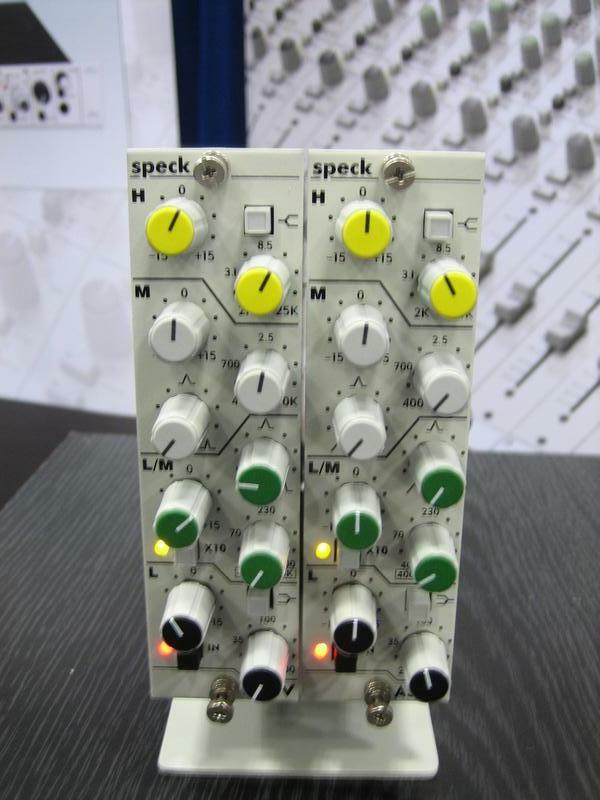 The frac-rack modules will the sold through Analogue Haven. - Jared's new Future Retro XS sounds great. 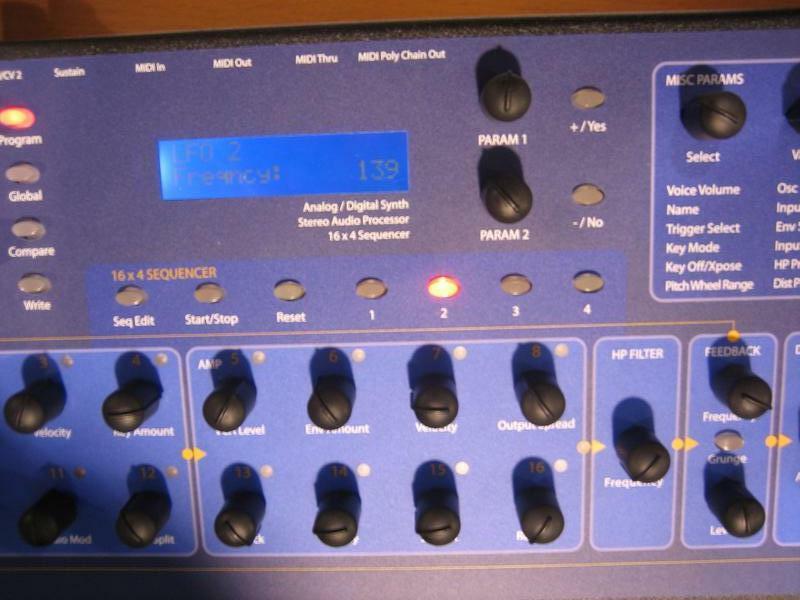 He's put a good bit of effort into the prepatched routing and this synth can do some neat tricks. Target price of $600ish seems high to me compared the great value of his other products but isn't out of line when compared to purchasing individuals modules from modular manufacturers. I really liked the sound and attack/decay accent feature. 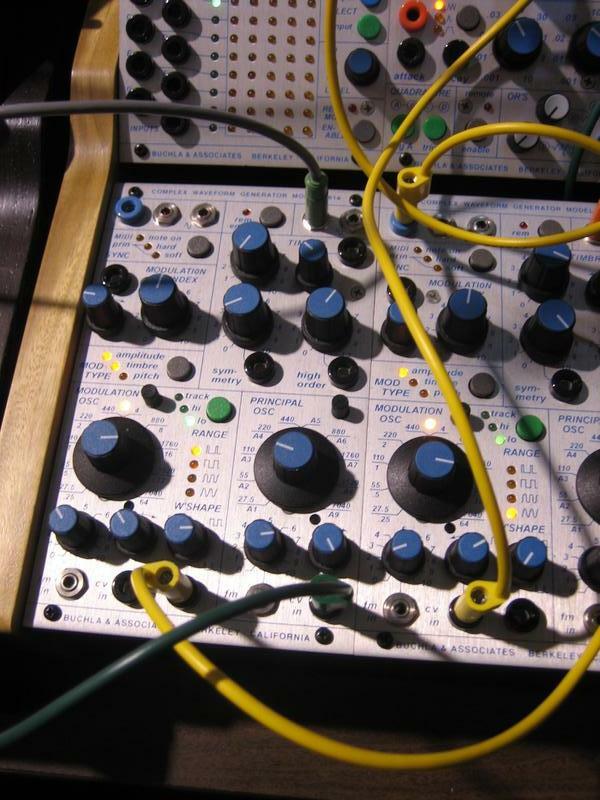 - New Buchla modules. 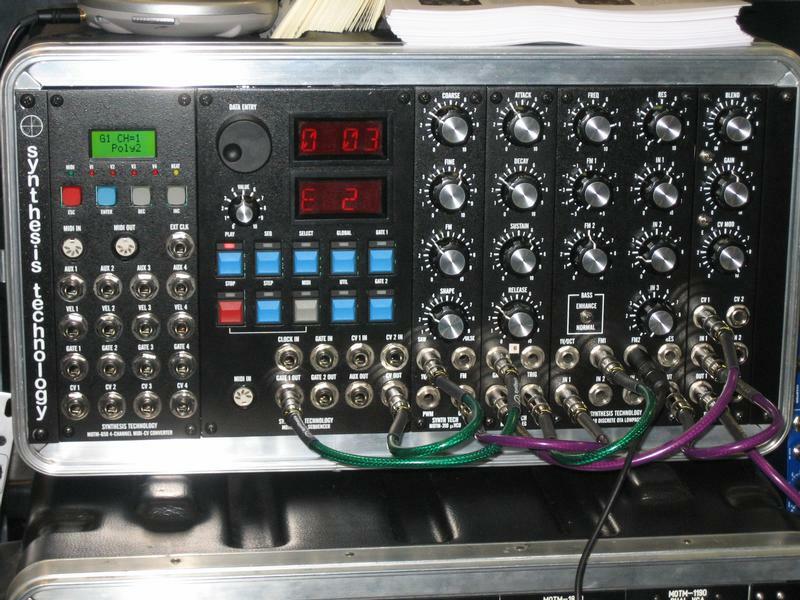 The 250e Arbitrary Function Generator (sequencer) with knobs for each step instead of single knob data entry as on the 249e. The 261e Complex Waveform Generator (VCO) is an analogue oscillator with built in audio rate modulation source and voltage controlled waveshaper. I liked the idea of the 256e Quad Control Voltage Processor but was disappointed that is only has a single break point. I would much rather be able to load complex transfer functions (even 7 bit would be fine) from MIDI or USB. And finally, the coolest new addition to the 200e line is the combination Thunder/Lightning module pair. The Thunder control surface is installed in the bottom boat, and the I/O module in the top boat. There seemed to be a good bit of flexibility in assignments and the ability to do two polyphonic groups. I thought it was fun to play and would enjoy checking out a full fledged Thunder now. 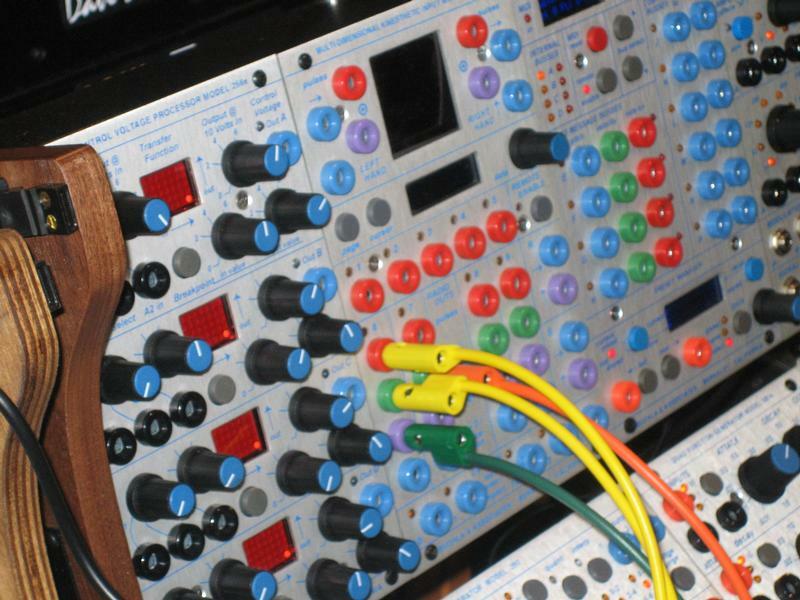 - The Metasonix S-1000 tube based modular synth was on display in not one, but two booths. Interesting sounds and textures. 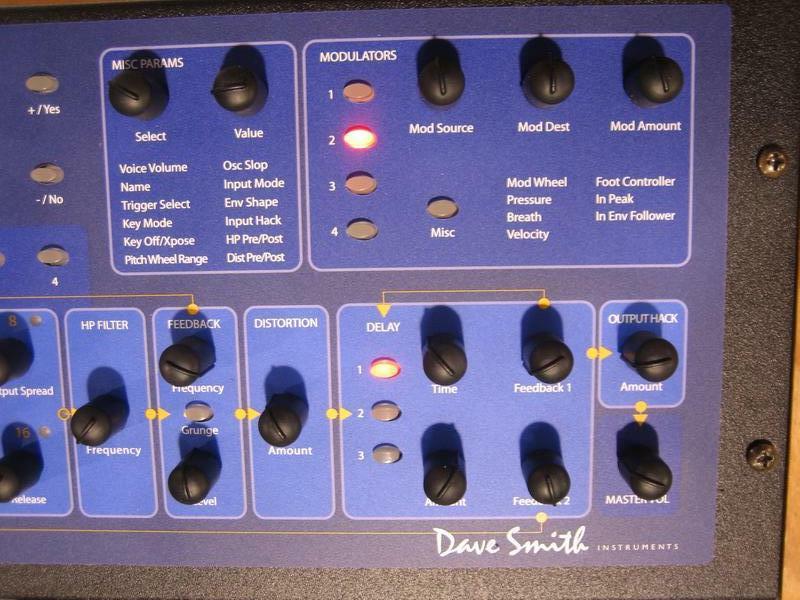 A bit more controllable than previous Metasonix synth products with quite a few modulation routings built in. I was even tracking over a two octave range. 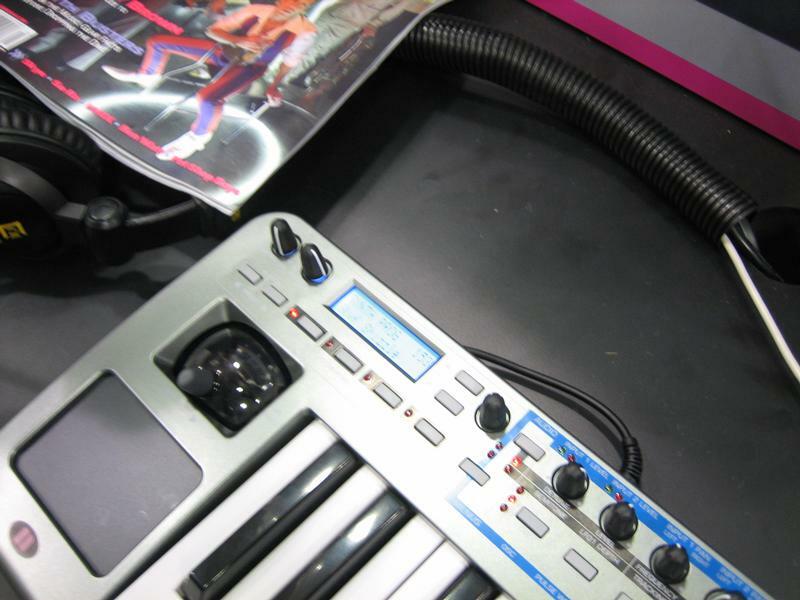 - Korg was showing their new Radias concept synth. It appears to be the replacement for the MS2000 line and had an interesting (although not so well-engineered or sturdy) tilt up panel. 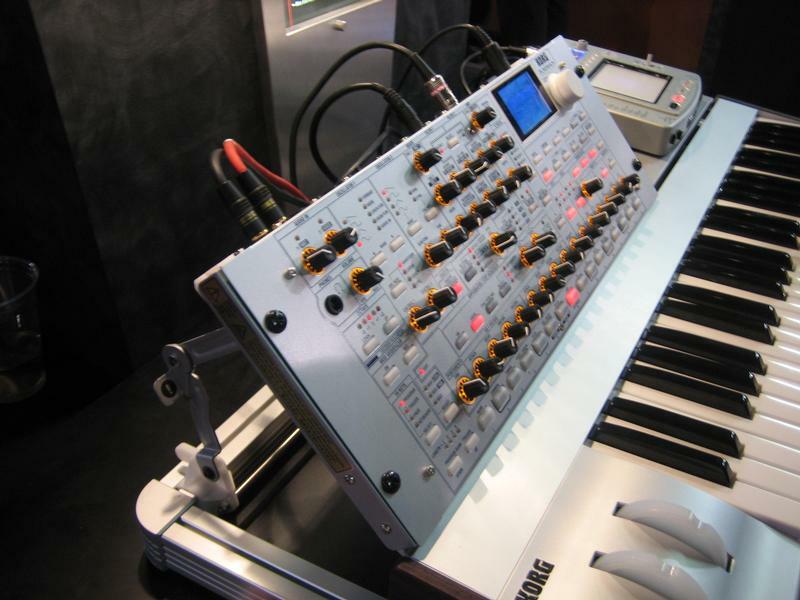 The synth itself is a shallow 4U rackmount device, and the keyboard and supporting frame are designed to be generic so as to support other modules down the road. I picked up a Yamaha CP70 electric grand piano from Doug Terrebonne in east bay today. It was local and in pretty decent shape, so it was too hard to pass up. I've been craving a CP70 since realizing that my favorite piano sounds in the Roland MKS-20 were actually based on the CP70. Long before digital sampling, touring acts needed a stage piano that could be amplified as well as handle the abuse of touring. The CP70 with its soundboardless design, tolex case, and individual string pickups handled this with ease. After loading the CP70 into my Element I can assure you that the roadies did not move them with ease. You can hear the CP70 on tracks from the likes of Howard Jones, Stevie Wonder, Genesis, and practically every other band in the late '70s. Went to see the Lovemakers tonight at Cafe Du Nord with Jeff, Karl, and jra. It was a fantastic show, even better than the show I caught last fall. They played some great new songs which I assume will show up on their upcoming release "Times of Romance due out Aug 23. They're playing in LA next Wed and again at Cafe Du Nord next Friday. After that they won't be performing until the release party. I spent last week at Creation East in Mt Union PA. This year's lineup was top notch and included David Crowder, Rock'n'Roll Worship Circus, Delirious, Audio Adrenaline, 12 Stones, Switchfoot, Paul Coleman, Steven Curtis Chapman and lots of other good groups. I caught David Crowder at the children's tent last year and he was so good I picked up all his albums. This year he opened the Saturday evening line-up on the main stage. Rock'n'Roll Worship Circus was really good. 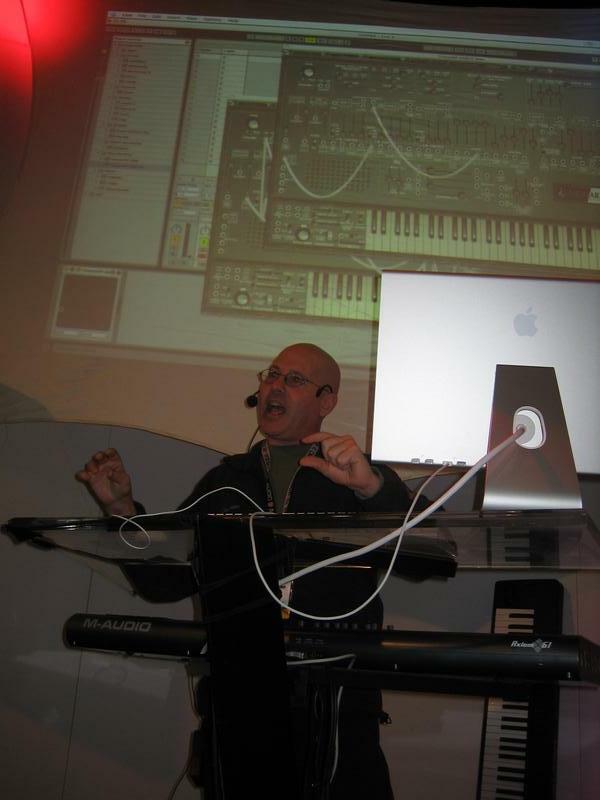 Their keyboard player uses two Moog analogue synthesizers and an ancient Vox Jaguar organ. I didn't know praise and worship music could make that much use of synth sounds. The bass player switches between bass and guitar so the keyboard player does a good portion of the bass lines on his Moog. He pretty much nails Geddy Lee's Moog Taurus bass pedal sound. Mark and Adrin [Raikes] Fisher camped with our group this year. It was good to see them as they haven't camped with us since '97. I have some pictures up here.